Large Rigs should use the Truman Gate. ---- Truman Gate (open 24/7): From I-25, Exit 222/Gibson Blvd SE, follow signs for airport. Turn right at Truman St SE and gate is right there. Turn left at second light, Randolph Rd SE. Follow Randolph (name changes to Kirtland Rd SE) then left on Hardin Blvd. Follow Hardin (name changes to 20th St SE). Turn left at G Ave SE traffic light and you'll see RV park. Turn at first right, which is F Ave SE (on maps) but the street sign says Frost Ave. ---- If less than 30' in length (total), you can use the Eubanks or Gibson gates. But these gates are still difficult to navigate in a RV. ---- Eubanks Gate (open 24/7 - closest gate to the park): I-40, Exit 165 (Eubanks Blvd) and then go south on Eubanks Blvd NE. You will pass the Nuclear Museum on your right. Gate will be just ahead after a half-right bend in the road. 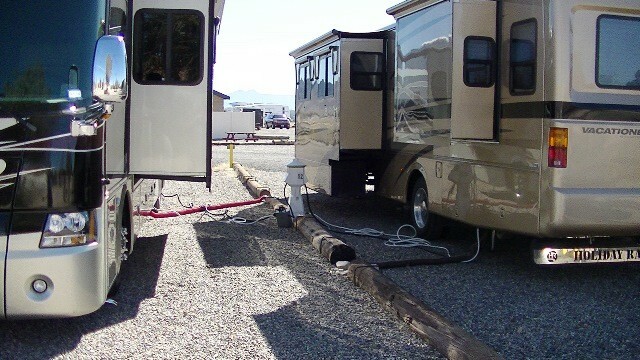 Gates are narrow so be careful - Many RV's have been damaged. After entering the gate, turn right on F Ave SE. Famcamp will be on the right. Office is the second right. ---- Wyoming Gate (open Mon-Fri 0530-1900hrs): I-40, Exit 164 (Wyoming Blvd) then go south on Wyoming Blvd NE. You'll run right into the gate. After getting through the gate, stay on Wyoming and turn left on Frost Ave SE (turns to G Ave). Turn left on 12 St SE (just before a parking lot and past the parade field) and then an immediate right on F St SE again. Famcamp is on the left. ---- Gibson Gate (open 0530-2200hrs): I-40 Exit 162 (Louisiana Blvd) then go south on Louisiana Blvd NE. Left on Gibson Blvd SE. The gate will be directly ahead. Stay on Gibson past Commissary, BX and Gas Station, At light, turn right on Wyoming. Follow directions above for Wyoming gate. Check-in instructions are on the wall of the office. Pets welcome. Normal leash, pick up rules enforced. Large pet run. Watch your pet closely as there are a lot of thorns (Goatheads) and they HURT. The dog run seems to be free of them. The stay limit changes frequently, depending on demand. Currently, the stay limit is 30 days in, then 1 day out before returning. There is always a 180 days total stay allowed in a calendar year. If you would like to transport a firearm on Kirtland, you are permitted to have it in your vehicle, but a few preconditions must be met. First, the firearm may not be in a usable configuration; it must be unloaded and the chamber cleared. It must also be in a locked container or compartment. There are small gun safes available, which fulfill this requirement or you may lock it in the trunk of your vehicle. Second, ammunition must be separated from the firearm. For example, if you choose to put the firearm in a small safe, the ammunition may not be in the safe, and if you choose to lock it in your trunk, the ammunition may not be in the trunk. Lastly, you must immediately declare the presence of the firearm to any law enforcement when stopped or questioned. Storing a firearm on the installation is also permissible. Unless you reside in the dormitories, you may store the firearm in your vehicle, but the vehicle must be locked and the firearm must be out of sight. If you reside in base housing, and store the firearm in your residence, you must register the firearm by filing an Air Force Form 1314, and a Department of Defense Form 2760 with the armory in Bldg. 20221. If you have a New Mexico concealed carry permit, it does not authorize you to conceal, or carry a firearm on the installation. If you do decide to bring the firearm with you on base, you must first unload and secure the firearm in a locked compartment. If you are pulled over, you must let Security Forces know immediately. If you leave the firearm in your vehicle, it must be out of sight and the vehicle locked. It had been 5 years since we were last here. Not much has changed. This time of the year, the park was less than 50% occupied. Since it's not busy, they changed their stay limits to 30 days instead of 14 days. While the FamCamp is old and nothing great, I disagree with a previous reviewer about closing the campground. It's still a good location and price to stay in the Albuquerque area. You won't find FHU sites for this price anywhere nearby. 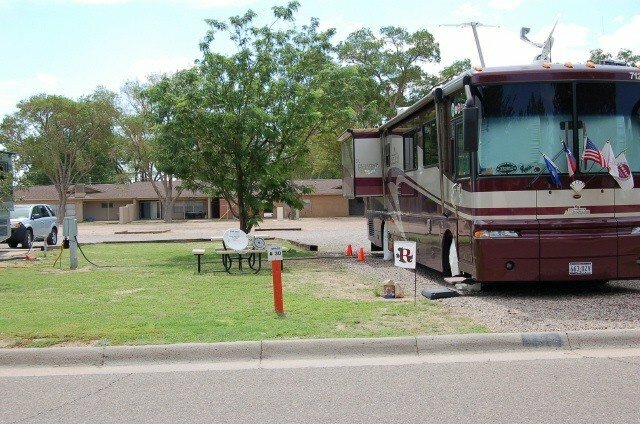 Just don't expect the FamCamp to be a fancy RV resort. The base itself has all of the amenities you would want. Commissary and BX are large. Fuel (including diesel) was slightly less priced than off-base. I also agree, and verified, the Truman gate is the best gate to sue with a large RV. It's not the closest gate to the FamCamp, but it's the easiest to get through and drive to the FamCamp. The road to the Gibson gate entrance is undergoing major changes and now includes many tight turns. The staff at the park were friendly. I feel that all the others who gave reviews were at another camp. I was shocked at how much the park is not maintained. The manager indicated their maintenance guy retired and they had no one for a long time. The problem with this campground is simple. None of the funds collected are going back into the camp. Laundry room too small for the size of the camp. Amenities are awful. Everything looks run down. Sand spurs everywhere that coat your tires, feet and everything else. The overflow is so full of fire ants that I had to move three times and gave up and left the camp. Even the FHU's look rough and ugly. The road to the camp is very residential and too narrow for big rigs. If I were the commander I would close the camp. The base commander and his staff clearly do not care what happens to this camp. This isn't the camp staff's fault, reminds me of an old KOA that wasn't ever remodeled since 1965. I have stayed at many installation camp sites from all the services and this one gets my vote for the worse! STAY AWAY!!! Let it die a natural death! Don't reward poor leadership all the way up the chain of command. Go in the Truman gate. This is a giant base so be patient and you'll find the fam camp. It's a large parking lot but very large spaces on the "new" side...no trees just gravel. Fine if this is a jumping off point to see things in the area. They really need to take reservations here. We were lucky and rolled right in but I'd hate to get all the way here and not have a place. 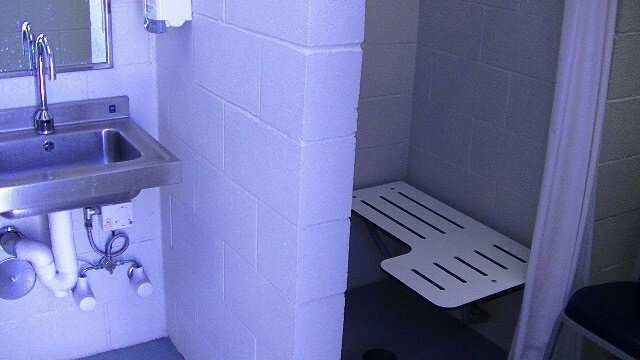 I thought the bathroom/shower rooms were just fine and were very clean. Power was off the last morning we were there which was a small inconvenience. The woman at the desk of the fam camp was helpful when I called prior to getting there but grumpy when I checked in. Maybe she just had a bad day but she was a bit dismissive which put me off. The base has everything you need for food shopping and other stuff and the location is great if you are exploring the Albuquerque area. We were surprised at how close it was to everything. The hookups in the 'new' area were a little confusing as you have two sewers and two waters next to each other (so one RV would then face one way, one face the other) but we got there first and picked the ones we wanted. I liked it here as a base of operations for that part of New Mexico. The nightly fee was reasonable. Again....it would have felt a little better if they took reservations but it's a big place so not sure if it ever is full to capacity. The Wyoming gate is NOT RV Friendly. Avoid it even if you are a class C. I got caught in the barriers and with two blocks of traffic backed up had to go on forward. $30+thousand in damage to my motor home. Eubank gate is ok but very narrow. 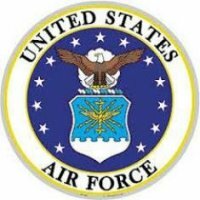 Typical of Air Force FamCamps, overall in need of maintenance on just about everything, overall good FamCamp but not great. The Truman Gate (24/7) located on the north side of the the base is Big Rig friendly and does not have any barriers or obstacles. The newer section has large wide sites using common FHUs between the sites. There's absolutely no shade in the newer section. Signage here is horrible. I had to park in the area just south of the newer sites and walk around to find the office. The office is closed on weekends. There are instructions at the office for after hours check in. When arriving after hours you can park in any open site that does not have a cone in it. Then fill out the reservation provided at the office, place it in the dropbox, then mark an 'X' on your site on the campground map. You can pay by check or credit card. If paying by credit card go to the office and provide your credit card info. If you drive your RV into the last road on the west of the FamCamp you will need to disconnect to turn around if no sites are available. In the older area most of the site are not really big rig friendly. Dense trees offer good shade but can be a problem with large RVs and slides. During our stay here there was some tree trimming going on. Site 25 through 33 in the older section are big rig friendly. Those sites offer some shade and green grass. If you want grass and shade those are the best for big rigs. Sites 25 through 33 share a common power pedestal. 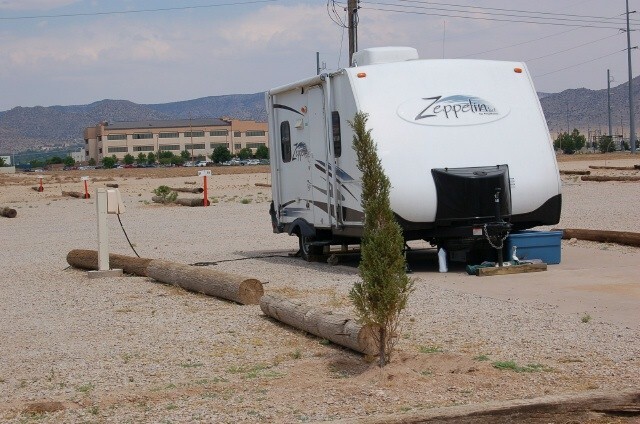 Which means on some sites you will need to run you power cord under your RV to the power pedestal to the right of your RV. Be prepared and bring an good extension cord. In sites 25 through 33 every other site has a concrete pad. There is WiFi but almost useless with .71Mbps download, 3.07Mbps upload. Verizon Data 34Mbps download, 16.8Mbps upload. AT&T data 6.90Mbps download, 15.1Mbps upload. Verizon cell service was good. The restroom photos here are outdated. 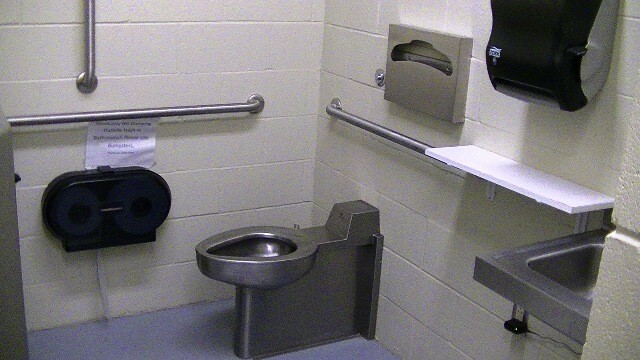 Both the newer and older section restrooms are in need of repair and updating. The newer section is the worse, very grungy and smell like poo! I personally would not use the shower in the newer restrooms. The laundry photos are also in need off updating. 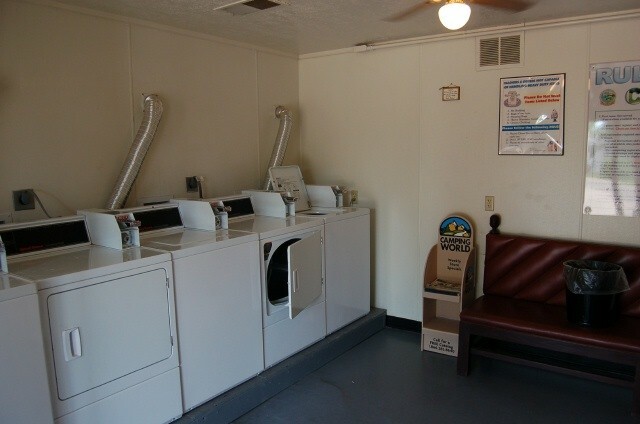 The laundry room now has stackable washer and dryers. The dog run photo is also in need of updating. 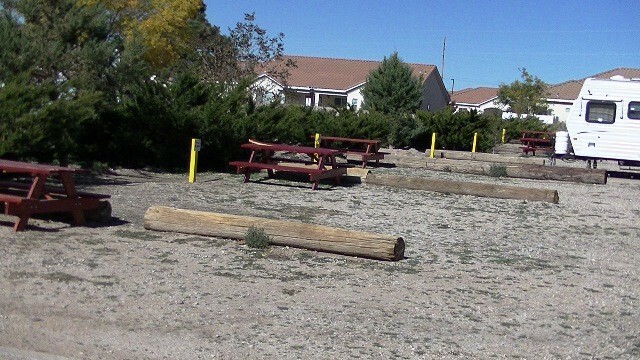 The dog run now has large shade tree, but the grass is now gone. I've posted update photos of all. We are a 45' motorhome towing a truck. In the past we were just skinny enough to use the Eubanks gate, but decided to try the Truman gate. The gate is several inches wider than Eubanks, so passage was easy. Not so easy though for long rigs like ours are two of the left turns from a two lane to a two lane road.. If there had been traffic on the street we were turning into, people would have had to back up. Still, I recommend this gate over the others. Gibson for example does not allow vehicles with three or more axles. Eubanks during the early AM traffic has all lanes open, but later funnels everyone into one lane and after you enter, they have raised barriers so it becomes an "S" and is too short for any RV. 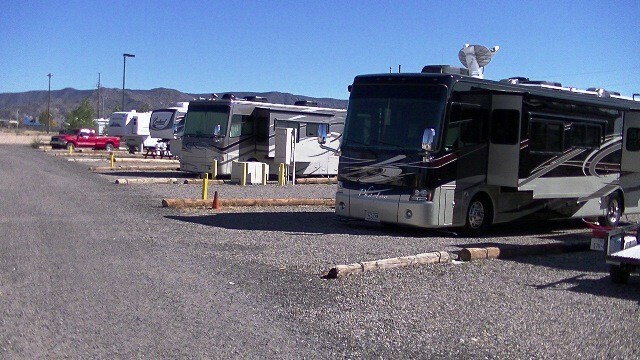 We always stay on the new side because the sites are so long and wide you have plenty of room for any size RV and vehicle. They do not take reservations, but we have never found the park full during Spring, Summer, or Fall (never been here during the winter). 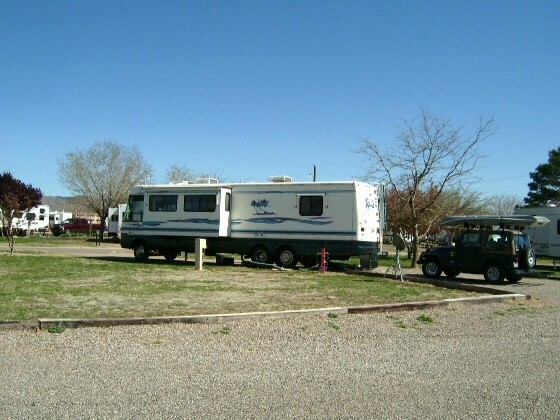 The campground has a lot of sites. I was lucky to get a shady area as the temps are getting up there during midday. Really enjoyable 4 days as there are a lot of things to do in Albuquerque and on base. I ran, biked, golfed, visited the BX. No library on base - they have a sign to visit the off base libraries. Wifi at the camp is usually good based on demand. Slow at times. There is a very nice Nuclear History Museum immediately off base (Eubanks Gate).....Fam Camp is visible from the Eubanks Gate so I recommend you use that to get on base (Off I-40 exit Eubanks). $18 for full hook up is a bargain. There's a nice gentleman working on the flowers, grass other upkeep and he's making the place look nice. HOWEVER...if you use the restrooms....they're pretty nasty. That's the only bad comment about this camp in my opinion (cleanliness). Very nice Park. Staff is very accommodating. Pretty nice for location on the base, dusty and dry gravel pit. Dog owners need to pick up after themselves. Only spent three days, but others where homesteaders. We stayed in the new section with spacious sites. Janet, the site manager runs a good park fairly considering no reservations required for campground. The Truman gate is a ways from the famcamp but works best for big rigs. We would stay here again. This was the first Fam Camp (out of 33) that we have stayed at that did not take reservation. We were a bit nervous traveling and staying through 14 different states and not being sure if we had a site. Called in the morning and they said they did have several sites available. We did get a site, but the park looked full shortly after we arrived. The employees were very nice and addressed a concern (our absentmindedness) promptly. We were on the east side and the sites are very well set up and by far the largest of any site in a Fam Camp we have stayed at previously. The bath house on the east side had 2 separate rooms. Each with a toilet and shower. They were clean and great water pressure. Only small complaint is we couldn't get anywhere on their WiFi. Used our own Jet Pack. Another thing to remember is sometimes those canyon winds can be intense, as they were one night we were there. When using the Truman gate arriving, do not get in the right hand lane with large trucks entering. A guard came up to us and told us to try to get into another lane as the right hand lane checks would be over an hour to get through the gate. All in all a positive stay. Our 2nd stay and we've like both of them. This isn't a fancy FamCamp but it is very useful. I gave Cleanliness/Hospitality a 3 star for cleanliness only. The host was very friendly and helpful. Our site was a little "goofy" - had to run power under coach and use an extension cord to finish hooking up. Oh well. 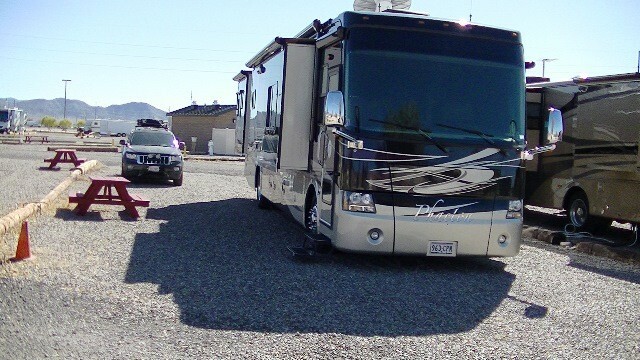 Fellow RVers were very friendly BUT one of the long term folks had a pit bull that probably needs to not be there. Didn't bother us but it was really almost off the chain ugly. Not a bad FamCamp and it's quite secure (considering the location of Kirtland AFB in the Albuquerque area). Access to the base can be problematic - we came in from East I-40 and had to go to the west side of the base to the Truman Gate to get in. If you're not familiar with Kirtland/ABQ it would have been a nightmare for you. Info on Kirtland entry recommends not to use the Eubank Gate; however, an RVer had just come through it with a fairly large 5th wheel and he didn't have an issue. Looking at the entry there I don't think I would have had any issues with my 35 ft fiver (Wyoming Gate was closed inbound due to construction). As for the FamCamp it's plenty spacious and was about 30% full - sites are gravel and not much shade in the new section (not a factor in the winter). Office doesn't have much to offer but check-in was quick - staff could have been a little more proactive. Also, laundry room doesn't have a change machine and the office doesn't provide change; so bring your quarters if you plan on doing laundry. Overall our stay was nice and I would recommend this FamCamp. Stayed here 3 weeks. 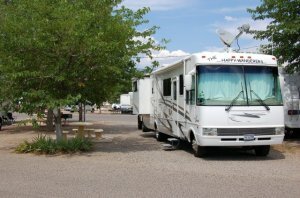 Not fancy, but given the high crime in Albuquerque, we felt very safe on base leaving our fifth wheel for long periods. Staff friendly. As others have said WiFi is horrible. Unable to stream anything without long buffering periods. That’s about the only negative. Given the safety and cheap cost we will stay here again. Be sure to follow the instructions for big rig entry otherwise you’ll be in a major pickle. Very helpful. Haven't been here in some years. Still a fine place to stay. Very well kept up, helpful, friendly staff. With the park not full wifi was adequate for most purposes - forget streaming anything tho. I can't figure out the gate issues. We saw no serpentines at Eubanks and only a shallow serpentine at Gibson. Saw city buses go through both. Yes Eubanks is tight but we've been through it before and Truman looked to be the same width on exiting. Still, Truman is probably the safe bet. We knew that arriving here and getting a parking spot at the famcamp this close to the start of the Albuquerque Balloon Fiesta would be a challenge. We called a couple of times and talked to the park host and got detailed information on what to expect upon arrival. She took our number and said she would call back when she had more info and she actually did call us later in the day. We arrived at 0800 and at 0900 she came to the office and started the roll call for the folks on the waiting list. There were 4 people ahead of us who were parked in overflow and she took care of them first. Then she called the name of a guest who was scheduled to leave to make sure they didn’t want to extend their stay. (Folks already in sites have first chance to extend their stay). They didn’t answer the call so we got their site. The lady came just as my wife was leaving and said she wanted to stay but was told she was too late. I believe the way they run the movement of folks into and out of the park during this busy time is very fair and organized. The campground host here is the best we have seen in any military park we have visited. The park’s Wifi is usable (from site 72) sometimes depending on the time of day; early mornings and late at night being the best time. Verizon 4g service is great in the mornings, late evenings and weekends but during the day it is very slow. No problem getting a satellite signal in the "new" section. 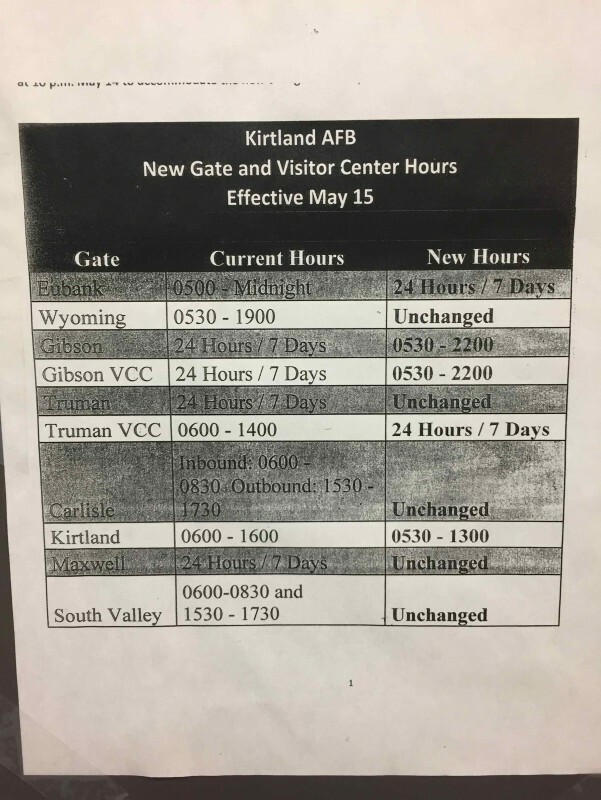 New gate hours: Truman & Eubanks gates, 24/7; Wyoming gate, 0530 to 1900, weekdays; Gibson gate: 0530 to 2200. The Security Forces have again made the Eubanks Gate even more difficult to get through with the addition of more barriers. I’m not sure I would drive any RV through there but for sure nothing over 30 feet. I watched a very large and expensive RV go out the Eubanks gate (escorted by security forces) and put a very long scrape on the side of his rig. Fair Warning do not use Gibson Gate. 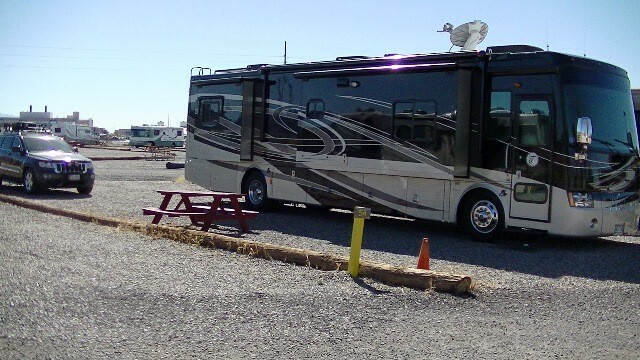 There are concrete barriers that will damage your RV and can not be moved. Truman Gate is the best to use for entry, period. The wifi will not even allow us to check email. 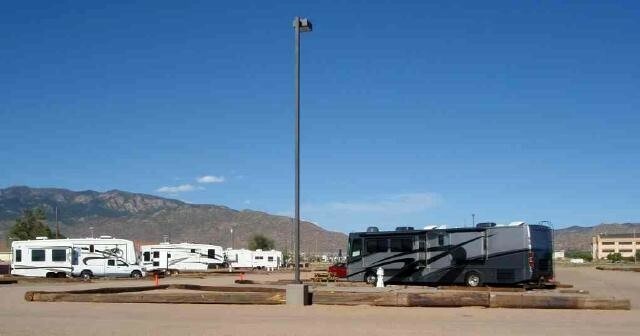 The RV is large and first come first serve. Most of the sites are gravel and very large. We did enjoy our stay as there are so many things to do in Albuquerque. First, the gate hours are changing effective 15 May. You need to update that in the directions. I have uploaded a photo with the new hours. As for the park itself, not bad. The directions on this site are great. We came in on a weekend and used the Gibson gate and made it through just fine with our 35' MH and towed. The older part has some trees, but they need trimmed as our rig would not fit under the branches. So we picked a site in the new section. 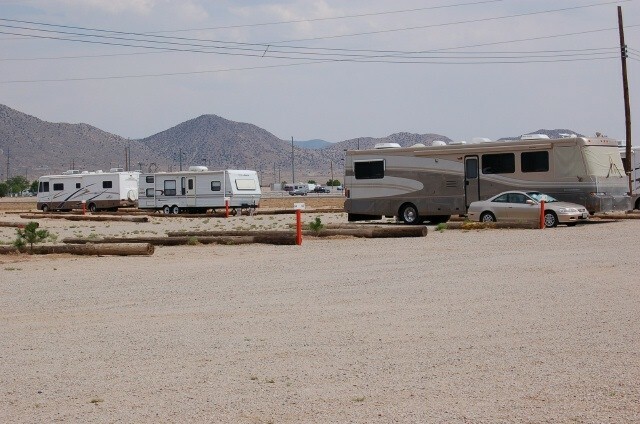 Typical "desert" RV park. Gravel sites, shared utilities, limited shade. However, this is a great place to stay. We were delaying for snow storms and cold weather and wanted a hook up to keep from freezing and this place was perfect. Watch out for all the "sand" burs, some call them "goat heads". There are millions of them in the grass and in the open areas. We did not walk our dog in those areas. Check-in was easy and straight forward. Probably the best Wi-Fi we have had at any military campground. Kudos for that!! The new side has limited showers and bath and no laundry, but that is fins as most folks that stay on this side do not use. The laundry was clean and working. Extended our stay easily to three weeks by talking to Janice in the office. She was very helpful. We were able to get into the older section under a large pine. May have to scrub sap when we get home but it was a very nice site. We have a 24 foot Navion and tow a Jeep. The site was surprisingly level. There is a building next to the office for men/women bath/showers and the laundry between. Only one shower but I never waited for it which was surprising because this campground is busy. Laundry was very busy at times and the machines took some abuse with some out of order most of the time. Speed Queen would be a better brand for this type of facility. Although they are easy to operate, it would be nice to have operation instructions posted. The wifi worked well for us. Tons of tv stations available with an antenna. Commissary and exchange and gas station convenient with redbox at the gas station. We brought our golf clubs hoping to play golf several times but played only once dt high winds and circumstances. Okay course...pretty rough. Surprised that they are able to keep it open because we seldom saw more than one or two groups on the course. Fun place to have lunch with pretty decent food, but crazy hours. Closed on Monday and Tuesday while we were there. The indoor pool and a fitness center is near the Gibson gate and we utilized both several times. The pool is nice with lots of lanes. We hope to stay here whenever visiting family although, hopefully, not for three weeks!